For many recent college graduates, the idea of what to do once you have a degree is intimidating. The Graduate Professional Studies (GPS) program gives college graduates a chance to pursue their interest while figuring out their next steps. "It is a good decision, particularly for those recent graduates who are not yet sure whether they wish to pursue a master's degree or go straight into the workforce," said David Thirkill, a GPS alum. Thirkill participated in GPS in the fall 2014 semester, studying international relations. He attended American University and majored in International Studies, but was unsure of what to do after graduation. Thirkill saw the program as an opportunity to be introduced to a variety of possible career paths in his field of interest. "It is not easy to get a foothold in Washington, and this program was a good way to do that," Thirkill said. "Many employers in the city seem to be familiar with the program, and may therefore offer internships more readily to its participants." During the program, Thirkill interned with the Office of Investigations at the U.S. International Trade Commission. He believes the mix of academic credits and professional experience he received during his time in GPS made sure his graduate degree was off to a good start and also made him more qualified for a job in DC. 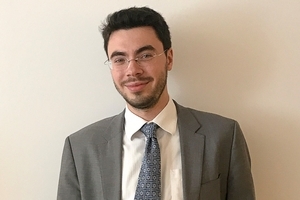 He now works full time at the International Monetary Fund while pursuing a master's degree in the American University School of International Service in the International Economic Relations program. Like many other students who have participated in the Graduate Professional Studies program. Thirkill saw the benefit of academic and career advancement the program offers.